Exploring the dynamics of development and dependency, this book traces the experience of Taiwan under Japanese colonial rule. 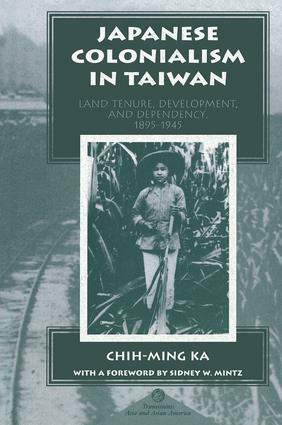 Chih-ming Ka shows how, unlike in other sugar-producing colonies, Taiwan was able to sustain its indigenous family farms and small-scale rice millers, who not only survived but thrived in competition with Japanese sugar capital. Focusing on Taiwan's success, the author reassesses theories of capitalist transformation of colonial agriculture and reconceptualizes the relationship between colonial and indigenous socioeconomic and political forces. Considering the influence of sugar on the evolution of family farms and the contradictory relationship between sugar and rice production, he explores the interplay of class forces to explain the unique experience of colonial Taiwan.